Get meals under control with STEP BY STEP instruction recipe booklet with crystal clear snacks, homemade pantry staples, and freezer meal recipes perfect for beginners that will please the whole family! What always overwhelmed me about meal planning was it was so much planning. Don’t laugh because I’m totally serious. I love canning because it allows me to stock my pantry with ready-cooked ingredients for cooking and snacks for me and the kids. And, it’s inherently NOT-planning. The recipes that I compiled with my good friend Elisa of www.mealplanningblueprints.com are a combination of snacks, homemade pantry staples, and freezer meals so you have a little bit of planning, a little bit of flexibility, and none of the what’s-for-supper madness. Elisa of www.mealplanningblueprints.com and I met after being online friends for about a year at a blog conference. We both showed up wearing florals and had such a blast together! Meal planning + jar planning = time freedom and meal flexibility! Downloadable and printable, as well as easily viewed on your mobile phone, this recipe booklet will guide you from meal planning overload to confident and cool mealtimes. Get the 10 Canning & Freezer Meal Recipes here! Worried about the canning portion? Don’t be! 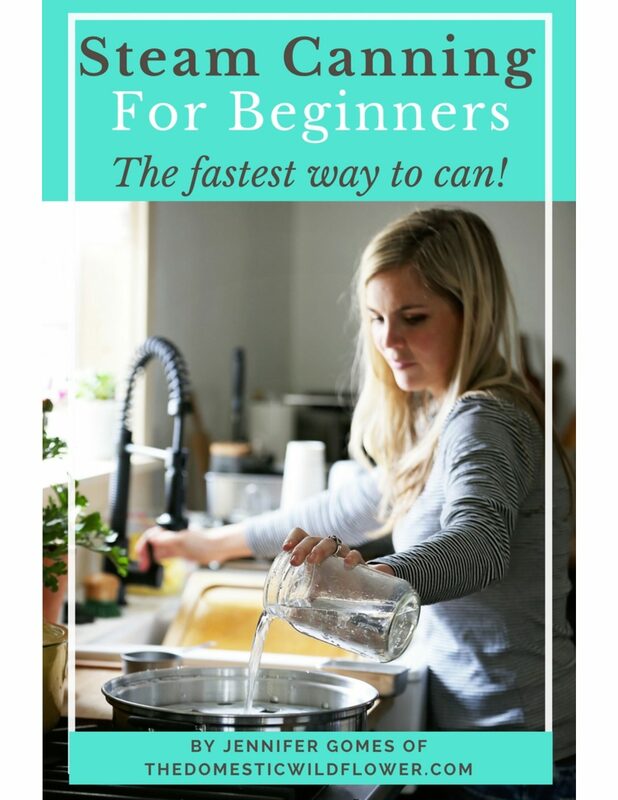 I teach beginners all the time in my Free Canning Basics Course! Making homemade salsa is a great way to use up all of the extra tomatoes from your garden and store them for winter. Discover how to make these 2 Easy Salsa Canning Recipes for Beginners. This salsa recipe is ranch-style because the onions, tomatoes, and peppers are roasted either under a broiler or on a grill until charred (blackened). Perfect for brand new beginners because it cooks up quickly, is giftable, is delicious, and is relatively fast. Read on for the recipe! Eager to learn to make these salsa canning recipes, but not sure how to can yet? Don’t worry: I have a Free Canning Basics Course that you can take with printable visual guides, videos, and more to get you started! Sign up here! Pickles are easy for new or beginning canners because they can up quickly and are fun to share as gifts. They are also a nice, savory departure from the canning standby of sweet jams. Read on for 3 Easy Pickle Canning Recipes for Beginners! Pickled pearl onions are an ideal recipe for steam canning, so I’ll include instructions for both steam canners and water bath canners. They are delicious on poached eggs, in salads, as part of an hors-d’oeuvres plate, and in a cocktail like a Bloody Mary. They are my favorite on poached eggs on toast with cheese, avocado, tomato, bacon…try it. You won’t be sorry. Steam canning is a really easy, lightning fast way to can all your favorite canning recipes. Read more about it in this post, or download the free Steam Canning Fact Sheet & Equipment Checklist here! Carrot pickles are one of my favorite pickles because they aren’t cucumbers 🙂 I actually don’t care for cucumbers much, to be honest, which I know is really silly but they just don’t light my fire. Canning them isn’t as easy as you might think; cucumbers for pickles should be small, very firm, and very different than what you’d want sliced up in a salad. Because of their mild flavor, you have to choose vinegar that really is tasty because it’s taste is what shines or screams. You have to use caution against boiling them too hard or too long for fear of making them mushy, and God knows no one wants a mushy pickle. This isn’t meant to discourage you but rather to educate and to offer an alternative if cucumbers aren’t your jam anyway. The purpose of this blog is not to merely document what happens in my little kitchen and sewing area, though that does happen a lot I admit, but to help you all learn how to make more by hand, cook more from scratch, do more for yourself, and improve your domestic lives by leaps and bounds as a result. And lots of you want to learn how to cook spicy, pickled savory things. The best way to maximize your canning time when canning these easy pickles is to use a steam canner. I wrote a helpful post about how to maximize your steam canning time here! What Produce Is In Season Now? What produce is in season now? This post will tell you which fruit and vegetables are ripe and in season. There’s a great graphic you can pin to Pinterest to reference any time and you’ll never wonder what’s in season again. Read on for the post! We’ve all done it: We’ve opened the fruits and vegetables drawer in our fridge only to find out that something has gone rotten, and far sooner than we expected it to. It’s disappointing, and it’s a hard pinch on our wallets, too. No one wants to throw those strawberries that cost a pretty penny—you want to eat them. There might be a reason for that waste that you haven’t considered, and a way to save yourself the agony of throwing things away (and save some cash, too): think about produce seasonally. Most people don’t do this. Within reason, they buy what they want to buy at the grocery store, and then they take it home. But a lot of that produce had to trek hundreds, if not thousands, of miles to get to you, meaning it has a greater risk of spoiling when you get it home. So how do you look at things more seasonally? This graphic explains it. Big thanks to https://zerocater.com for this graphic! The idea of buying fruit and veggies when they taste the best, are the closest to locally grown as possible, AND are the least expensive all seems too good to be true but that’s exactly what buying in season means. When you buy in season produce, you can purchase BULK, and then preserve, quickly and easily, wholesome jars with canning. In the Free Canning Basics Course, you’ll get easy, fast lessons on how to preserve ripe, fresh fruit and veggies, in a way that fits your busy, modern life. Dive in today! Apples are, dare I say, the perfect fruit. Portable, sweet, available throughout the year, nutritious, and versatile! Read on for 3 easy apple recipes anyone can make! This recipe for applesauce muffins is is a great way to use a healthy ½ cup of your homemade applesauce (or store-bought if you haven’t learned how to make it from me yet!) into a portable snack. Homemade applesauce is something that is easy to make, fast (only 10 minutes in the canning process and there’s an easy trick to skipping peeling and coring I’ll explain in the post) and you can skip the sugar entirely especially if you have sweet apples on hand. What the heck is a shrub?! Shrubs are fruit and vinegar syrups that are a NO COOK concentrate- just a few tablespoons of shrub into a glass with sparkling water and an optional shot of libation on top, Apple Shrub is a great recipe because it takes just one apple of any variety, is fun to spice up with cinnamon or a few dissolved red-hot candies, and mixed with whiskey. It is a cocktail that will transition your beverage game right into autumn. Learn how to craft shrubs from nearly any fruit (and some veggies!) with this easy, at your own pace email course! Dive into canning with this email course that makes canning fit your modern, busy lifestyle. Forget that giant, black canning pot and recipes that take all day; this course makes canning easy, fast and fun.